Weld Wire carries Chrome-moly products in mig spools, coils and tig rod. Some markets served are petroleum & chemical refineries, boilers, pressure vessels and pipe systems. 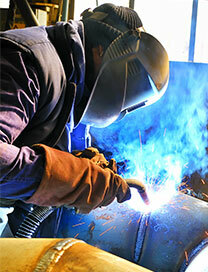 Weld Wire carries Stainless Steel electrodes, mig spools, coils and tig rod. Some markets served are food, beverage and petroleum industries. We are here to satisfy your stainless needs as no project is too large. Weld Wire carries Copper & Copper Alloys in mig spools, coils and tig rod. Some markets served are off shore oil or gas drilling, power plants, piping systems and oil recovery pumping systems. Weld Wire carries Nickel & Nickel Alloys in electrodes, mig spools, coils and tig rod. Some markets served are furnaces, boilers, power plant, chemical processing & petroleum industries. Weld Wire carries Aluminum Welding wires in electrodes, mig spools and tig rod. Some markets served are boating industries, fabrication of boat, cargo & horse trailers also oil & gas tanker trucks. Weld Wire carries Mild Steel & Low Alloy Welding products in electrodes, mig spools, drums, coils and tig rod. Some market served are the construction industry, waste management industry, tractor trailers, general construction & fabrication. Weld Wire carries a wide variety of welding wire products; let us help you pick the right product for your application. We at Weld Wire Company Inc. have committed ourselves to supplying our customers with what they want, when they want it. We ship any size order immediately from our inventory of welding wire and electrodes, including steel wire, stainless steel, copper wire, bare wire, and a range of other electrodes.